It's been quite a week for weather across the west. Eastern Colorado experienced its coldest temperatures of the year with overnight lows ranging from -19 degrees at Denver International Airport on Wednesday to near 30 degrees below zero across northern Colorado. In the mountains it's been days on end of snow. Resorts across Colorado, Utah, and California are measuring snow totals over the last five days in FEET, and the snow is set to continue into Monday. Denver's best chance for snow over the next week will come tonight as a few rogue snow showers are expected to spill off the mountains and onto the plains. Little accumulation is expected, especially in Denver, but the cold hazy weather we have experienced much of the day will continue through the overnight hours. The best chance for snowfall accumulation across eastern Colorado through Monday morning will be near the Colorado / Wyoming border, but even there totals are expected to be generally light. In the event a light dusting or half inch of snow does fall overnight in the metro, please use caution Monday morning as a few slick spots could set up on the roads. The trend will be a warming one for Denver over the next week. Monday will still be a bit chilly, but by Tuesday highs should really start to warm across northeast Colorado. As it looks right now, highs Thursday through Saturday could very well climb into the mid to upper 50s across the metro. In the mountains, snow continues Sunday night and Monday before beginning to ease in intensity. Expect most locations to pick up another 4 to 8 inches+ through Monday morning, with another couple of inches possible through the day Monday. Traffic has been a mess all weekend along I-70 with off and on closures being reported. Tuesday and Wednesday look to be the quiet days for most mountain resorts before another chance for snow returns possibly by late week for the northern and central mountains. Teleconnections continue to support a warming pattern across the west of the next 10 days or so. The east may also see some warming, but that could be a week out out still as another week of winter is set to hit from the southeast through New England. 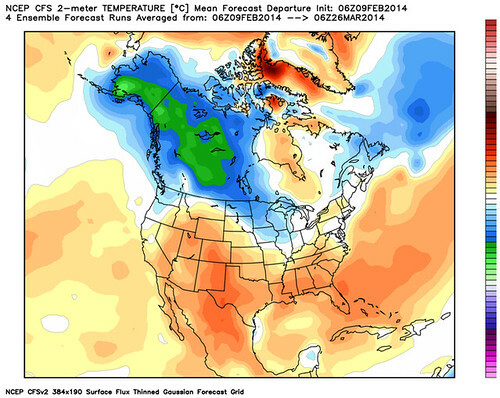 If we believe what the CFSv2 is trying to do, much of the country will shift to warm over the next 45 days. This is a bit hard to believe right now given the amount of cold still locked-up north, and given the amount of cold still on the way for the east over the next 7 days -- but we'll see. The GFS still is trying to pull a trough back into the west next week, while the latest Euro seems less inclined and keeps pumping the southwest ridge. At the moment not really sold on either solution. I think we warm up over the short term across northeast Colorado, but beyond 7 - 10 days I believe bears watching. Northern California Soaker, but a Drought Buster?